We are language lovers and people lovers. Lauren Aitken is a Florida transplant that has called DC home for the past 10 years. She's a language lover who has taken courses in French, Spanish, Arabic, Chinese, and Wolof. 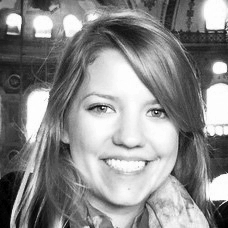 Lauren is working on her EdM in Education Policy & Management, focusing on world language education policy. Before grad school, Lauren worked for international exchange non profits and the State Department. Rachel is a Maryland native who has worked in the DC area for the past 10 years off and on. She taught English in Akita, Japan for three years with the Japan Exchange and Teaching (JET) Program. She loves practicing Japanese and has dabbled in Korean, Chinese, and Spanish. She currently works for an international exchange non profit and serves as the President of the JET Alumni Association of Washington, DC (JETAADC). She would love to learn German next! Sara Anderson is a native of rural Kansas who now calls Adams Morgan home. During the work day, you'll find her facilitating exchange programs for visitors from all over the world. Sara speaks German and Swedish and has dabbled in Russian and Spanish. Rachel Echeto is a Los Angeles native who came to DC in 2016. She first fell in love with language learning by studying Spanish and linguistics, and has since taken classes in French, Mandarin, Arabic, and Hebrew. She currently works as an administrator at a national security think tank. Hager Koraym has called DC home for the past six years. Born in Egypt but raised in Baltimore, she tries to rekindle her Spanish and native Arabic by listening to Shakira and Amr Diab. To convince herself that medical students like her have lives, she often ventures to cute, over-priced coffee shops like Potter’s House, Calabash, Philz, or Tynan. Claire Macfarlane learned German by way of a one year high school exchange in Berlin in 2009-2010. She now works as a Press Officer at the German Embassy and enjoys cycling, cooking, and reading when she is not on-the-clock. Alex Merrill is a Pacific Northwesterner who grew up speaking French and spent time working at a high school in the south of France before returning to DC. She has also taken classes in German and Arabic and spends her days working for a nonprofit focused on youth employment in MENA. Maurice Sayinzoga has been living in DC for the past 3 years. He loves to travel, drink coffee, and speak French! For his day job, Maurice works for Digital Impact Alliance at the United Nations Foundation.